If you're searching for a basic and fully function DMM. This 11 function digital multimeter (or DMM for short) is exactly what you need. It combines low price and simplicity to yield a fully featured and functional measurement and test devices for your electronics prototypes. 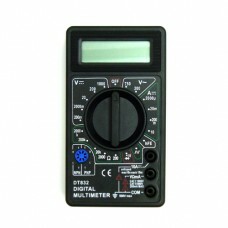 If you've never used or bought a DMM before, this is the one you want to start with.